Heat half the oil on a pan and cook the salmon for 3 minutes on each side over a medium heat. Remove from the pan and set aside covered with foil. Cook the noodles as per pack instructions. Heat the remaining oil in the pan and add the garlic, ginger, broccoli, chilli, stir fry for 2-3 minutes than add the noodles. Remove from the heat and divide between 4 serving plates. 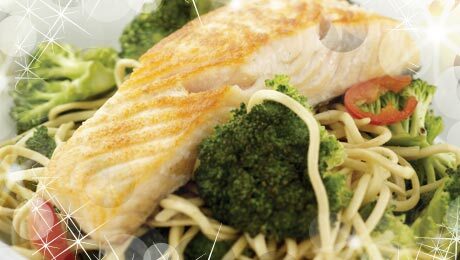 Add a piece of salmon to each plate and garnish with some fresh coriander and lemon slices.